Posted on Fri, Feb 10, 2012 : 10:54 p.m.
Pioneer's Aedan York drives against Huron's Mike Lewis during the Pioneers' 50-34 win on Friday night. Prior to the his team’s game against Huron High School, Rex Stanczak told his Pioneer players that they must focus on closing out the game if they have a lead. They responded by shutting down Huron in the second half of a 50-34 win that put them in first place in the Southeastern Conference Red Division. With 4:12 left in the third quarter, Huron scored to make it 33-30. It would be the last field goal the River Rats would make for the next 12 minutes, before scoring with 12 seconds left in the game on a Ernest Johnson jumper. In the last two contests between the schools, Stanczak felt his team outplayed Huron but couldn’t finish the job. So, naturally, he was pleased that him fought for the full 32 minutes. 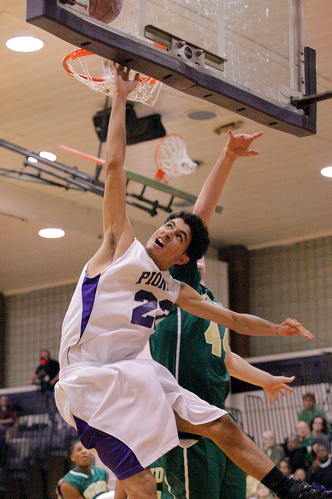 Pioneer's Jibreel Hussein, who scored a game-high 20 points, attempts a layup during a win over Huron on Friday night. Hussein led the all scorers with 20 points, eight of which came in the first quarter. A majority of his buckets came in the paint, a focus for his team entering the game. Huron opened the contest with three turnovers early, and looked out of sorts for the first few minutes. Samaha agreed that his team may have come out with too much energy because of the importance of the game and the rivalry. Down 19-12 with six minutes left in the first half, Andre Bond sparked a 7-0 run for the River Rats and two minutes later the game was tied at 19. Bond would score four of his team-high 10 points on back-to-back buckets, get a steal and find Allen Thomas open for a 3-pointer that tied the game in the two minute span. The two sides would stay close until the break where Pioneer would take a 24-22 lead as the teams went to their locker rooms. Coming out of the break, both sides clicked offensively and with a little over six minutes left in the third quarter, the game was tied again at 28. But just two minutes later, Huron’s shooting troubles began and Pioneer would start to pull away taking a 40-31 lead into the final quarter. Pioneer entered the game without one of its leading scorers, Ja’Korey Davis, who was injured late in Tuesday’s game against Tecumseh. Davis sat on the sidelines with a walking boot and is expected to miss 2-3 weeks, according to Stanczak. 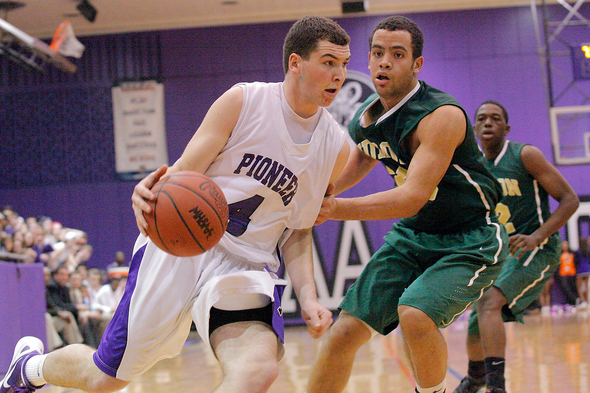 Even without one of its best players, Pioneer still found a way to cruise to victory. Although its in first place in the SEC Red, big road games against Temperance Bedford and Skyline are still on the Pioneer schedule. And while Stanczak enjoys beating a rival, he doesn’t want to put too much stock into a game played in mid-February.